Sweet potatoes are the perfect Fall vegetable – they’re both delicious and nutritious. They are a rich source of vitamins A and C, and contain substantial amounts of calcium and potassium. So when I saw a hundred-year-old recipe for Stuffed Sweet Potatoes, I had to give it a try. Preheat oven to 400° F. Prick each sweet potato several times with the tines of a fork. Place of a foil-lined baking sheet and bake until tender (about 45 minutes – 1 hour, depending upon size). Take out of oven, and cut each sweet potato in half. Gently scoop out pulp, and put into a bowl. Mash; then add butter, salt, pepper, and parsley. Mix thoroughly, then refill the skins. (The mixture should be heaped and nicely rounded–which means that not all the potato skins will be needed. ) Brush with beaten egg white. Put under the broiler until the top is lightly browned. I used less salt than called for in the original recipe because it seemed excessive for my taste. Posted on October 15, 2017 October 14, 2017 by SherylPosted in FoodTagged recipe, sweet potatoes. I wonder if this is one of those recipes that was developed to “fancy up” a plain (and inexpensive) food. It certainly would add a little something to a table — it’s more attractive than just splitting a potato. Another great-looking (and easy) recipe that I’m going to have to try this week. Thanks! Probably chicken fat or bacon fat. When I was younger my grandparents always had a tin can of these in the refrigerator for flavoring or frying. Now I just use butter. Those had a lot more flavor, but I’m sure are not good for us :(. A great recipe to try for Thanksgiving! Sounds like a winner. Delicious fall treat. 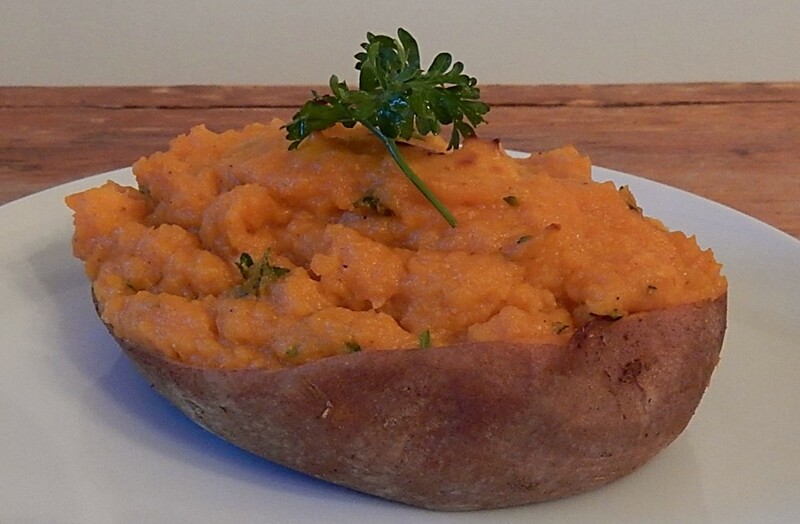 Dresses up a plain baked sweet potato doesn’t it.